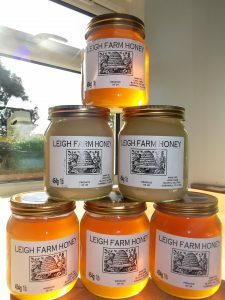 Leigh Farm Honey creating a buzz on the round! We’re very please to be able to offer a limited quantity of this season’s delicious honey from Leigh Farm, just up the road from us in Blunts. Annie has been busy collecting and potting up both runny and set honey into 1 pound jars. It taste’s amazing and looks just like a jar of sunshine! Available now on the website while stocks last. Then we’ll have to wait for the bees to wake up again!